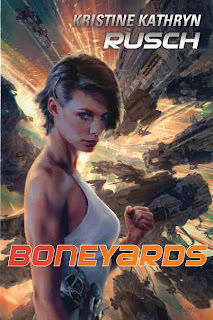 A couple of very interesting books received this week including Boneyards by Kristine Kathryn Rusch (PYR SF) and The Dread by Gail Z. Martin (Hachette Book Group). Boneyards is part of Kristine's Diving Universe series of space opera. The Dread is the second book in Martin's Fallen King's Cycle. I am currently catching up and reading Book 1 - The Sworn. These are ones I have not seen before, they look interesting! Have a great week! Hi Ellie, Kristine's stories are always fast-paced and easy to read. She's a Hugo winner so you know you are getting the good stuff. Gail Martin includes shapeshifters and vampires in her epic fantasy. Great character-driven stories.